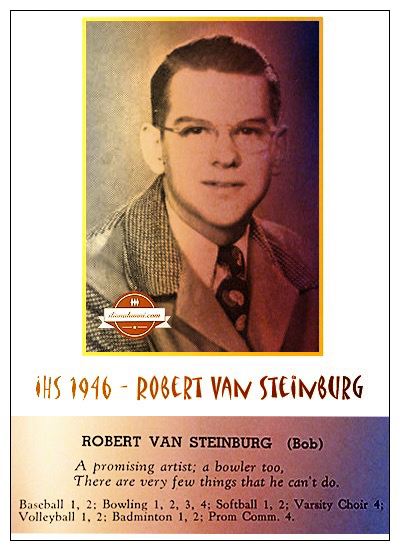 The senior yearbook caption aptly predicted the future profession of this distinguished IHS alumnus, Robert 'Bob' VanSteinburg. Robert VanSteinburg was born in 1927. He attended Ilion's West Hill Elementary School and graduated from Ilion High School in 1946. Bob and his classmate, Fern Chismore, were recipients of the Art Award during the 1946 commencement ceremony. After graduation, Bob continued his studies at Syracuse University. He earned Bachelor of Fine Arts degrees in Painting-Illustration and Art Education from Syracuse University. Bob returned to Ilion where he lived and worked from his studio on Highland Avenue. He taught Art in the Mohawk Central School District for over 30 years. He also taught at Herkimer County Community College. The Mohawk Homestead's YouTube Video features 3 Ilion Alumni. and 1946 alumnus resident artist - Robert VanSteinburg. 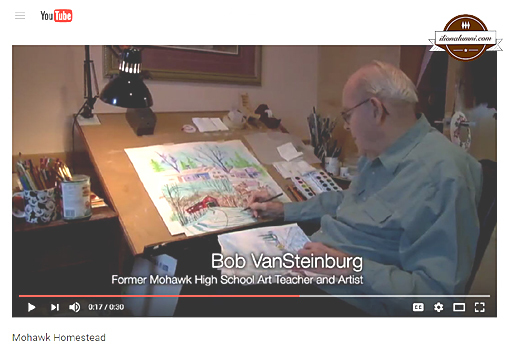 Today, at age 89, Bob resides at the Mohawk Homestead, where he continues his passion for painting. The Mohawk Homestead is an independent living, assisted living and specialized care facility in Mohawk, NY. Bob's sister, Dorothy (VanSteinburg) Daly IHS 1947 and her husband are also residents. The Homestead, formerly known as "The Old Ladies Home" has been in existence for over 120 years. Another Ilion alumnus, Carrie Richardson 1878 Valedictorian, was a major force in the early founding of the home and served as its Treasurer. She oversaw the funding for the addition to the building that was completed in 1906. Carrie Richardson served over 18 years on the Board of Directors of the Homestead, also known as the "Old Ladies' Home". Dorothy (VanSteinburg) Daly IHS 1947 with her brother, Robert VanSteinburg. 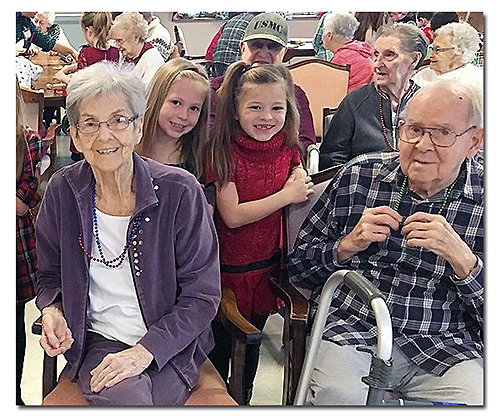 Poland second-graders became "Santas for Seniors" by donating items to Mohawk Homestead residents on December 9, 2016. Bob has worked on commissions for individuals and businesses, painting portraits to buildings to landscapes. 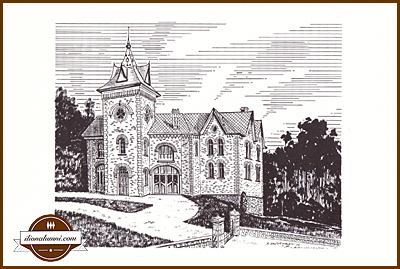 Above is the illustration of the Ilion Little Theater Club that was available in a set of notecards for sale at The Ilion Public Library. Prints of his work are also for sale at the Herkimer County Historical Society. Many of his original pieces have been divided among VanSteinburg's nephew, Tim Daly IHS 1979, and nieces, Leigh (Daly) Lytwynec IHS 1976, Kathy (Daly) Reese 1981, Mary (Daly) Salamone 1982 and Erin (Daly) Burger 1985. Leigh has a large 8-foot by 10-foot canvas paintings hanging in her home. He is especially proud of his large-scale paintings. The August 22, 1976 edition of The Utica Daily Dispatch article stated that he worked mostly in the technique of Gouache-water-color but he had a great love for oils. The biographic page on www.adirondackart.com describes his methods of creating his art works. As much as possible, Robert works from sketches done on location. Only where considerable authenticity is required will he take photographs. "My sketches allow me closer contact with the mood and feeling of the subject area." The landscapes of the artist are kept as true to their actual setting as possible in the artist's style of realism. Mr. VanSteinburg is a member of the Central New York Watercolor Society. 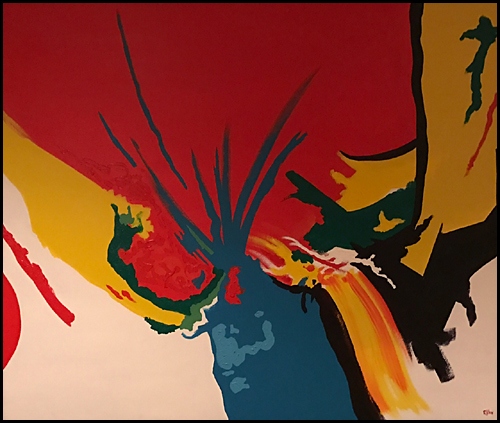 He has exhibited at the Mohawk Valley Center for the Arts, Munson Williams Proctor Art Institute, Adirondack Art Gallery, Herkimer College, as well as other venues. Bob has also had a long career as an illustrator for books and greeting cards. He began his first assignment with the Burgoyne Company while he was still a student at Syracuse University. Burgoyne has been a greeting card publisher and manufacturer since 1907. It is owned by KJS Industries, Inc. Bob said that working for the company was demanding and that he had to produce 15 to 20 paintings monthly. 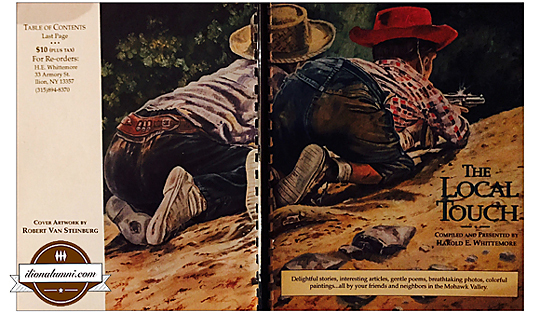 Bob created illustrations for the Prudent Publishing Company that was established in 1929. Bob's Christmas card illustrations for that company can still be ordered from the gallerycollection.com web site. [The] Christmas Celebration Holiday Card is a beautiful card for any and all country lovers. This is an updated Currier and Ives type of a card designed by one of our very own artists. Anyone who loves winter in the country is going to love this artwork done by Robert VanSteinburg. It really makes you feel like you are there; riding in the horse drawn sleigh and hearing those Christmas jingle bells as the horses gallop along the country road. You can almost feel the cold air as it rushes by your face, and the snowflakes as they land on your cheeks and eyelashes. The artwork used for this card is a hand painted watercolor piece, lending itself to a very soft and peaceful scene. It also has beautiful silver foil snowflakes falling in the background, which gives it a touch of rich sparkle. The name of the card is very fitting name because it speaks of a happy family enjoying a wonderful crisp winter day and the celebration of a beautiful Christmas holiday season. In 2014, Bob also participated in the New York International Wine Auction by donating an original watercolor, Cape Cod Beach Time, for the auction. At the time of the auction, the painting had an estimated value of $1,700. The New York International Wine Auction benefits Herkimer Arc Herkimer; a not-for-profit organization that serves and advocates for individuals with developmental and other disabilities. The nonprofit's mission is to enabled people with disabilities and others in the community to achieve full potential and to live enriched lives. In a recent article, on the ValleySide web site, titled "Ilion native is nationally-known artist", by Jessica Arsenault Rivenburg IHS 2002, Bob gave this advice to future artists, "Be passionate and it will never be work. Be original as much as you can. Learn from others and the world around you. What you take in through your eyes and head becomes part of you and then comes out again, from the heart, in what you make and do." On a personal note, I would like to thank Mr. Robert VanSteinburg for meeting with my daughter, Mary (Sweeney) DeBlois IHS 2002, when she was in high school and considering a future career in Art Education. Mary, just like Mr. VanSteinburg, earned both a Bachelor's and Master's degrees in Art Education from Syracuse University and has been an Art Teacher in the Fayetteville-Manlius School District for over 10 years. Sometimes, it's not what you know, it's who you know that makes a difference in your path through life. Would you Like to Mentor Too? Grads Urged To "Put A Heart" Into Today's Scientific Knowledge was the headline for The Ilion Sentinel published on June 27, 1946. The article featured the details of the Class of 1946 graduation ceremony. This brings us to the common topic from Bob's graduation ceremony, his own mentoring and a lesson that you can take away from it. Mentoring and networking is a wonderful way for alumni to help those students interested in any careers. Ilion Engineers, is a new networking group on LinkedIn for engineers and technologists from Ilion, NY. The group's purpose is to help members in professional career growth through networking and mentoring. Ilion Engineers also focuses on assisting and mentoring Central Valley Academy students interested in a career in engineering and technology. The group is structured to be accessible to students inquiring about careers, profession specific scholarships and college & university programs. The group is open to engineers and technologists from Ilion, NY by request. Check out Ilion Engineers on LinkedIn Groups.